A pre-built .pem file should have been emailed to you when your certificate was issued. If you did not receive that file, you can download it inside your account by logging in, clicking the order number in the "My Orders" tab, and choosing the link to download "ALL CERTIFICATES (Zip File)." Login to your Barracuda Spam Firewall. Go to the "Advanced" tab and then the "Secure Administration" or "SSL" page where you originally got your CSR file. There should be an "Upload Signed Certificate" button which you can use to upload the your_domain_name.pem file. To begin using the certificate you've uploaded, select Trusted (Signed by a trusted CA) as the Certificate Type after uploading the certificate, and click Save Changes. You may need to restart web services on your Barracuda for the new certificate to take effect. More information about installing an SSL certificate on your Barracuda can be found directly from Barracuda Networks. Please note - Some of our customers have reported difficulty installing a wildcard certificate to Barracuda Spam Firewalls. This isn't a problem specific to SSL wildcards. We hear that the barracuda will only issue a CSR for the name you give it, so if you want a wildcard certificate you have to name your barracuda *.yourdomain.com and that may not work with clustering. More information about using wildcards with a Barracuda device can be found from Barracuda Networks. Also - The Barracuda will expect to receive a certificate that EXACTLY matches all fields in the CSR it previously created. This detail can be a source of confusion and frustration if you're unaware of it. We can only issue your SSL Certificate according to what we are able to verify about your company. For example if you request a certificate with "O=TheCompany" and your company name is really "O=TheCompany, Inc." then we have to issue your certificate with "O=TheCompany, Inc." and importing that certificate will fail. 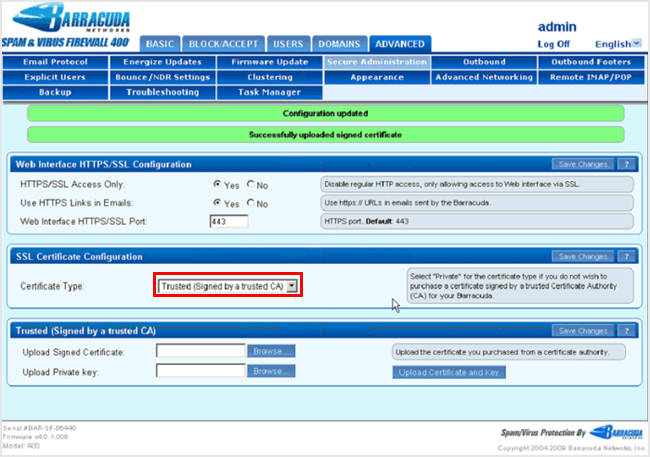 In cases where the CSR and the issued certificate do not exactly match, you can adjust the details in the Barracuda to exactly match your certificate and then download a new CSR from the barracuda and use the new CSR to reissue your certificate by logging into your account, clicking on Web-PKI manager, then re-issue your certificate.